Why UPS trucks almost never turn left? By avoiding left-hand turns, among other route optimizations, UPS says it saves 10 million gallons of fuel a year. 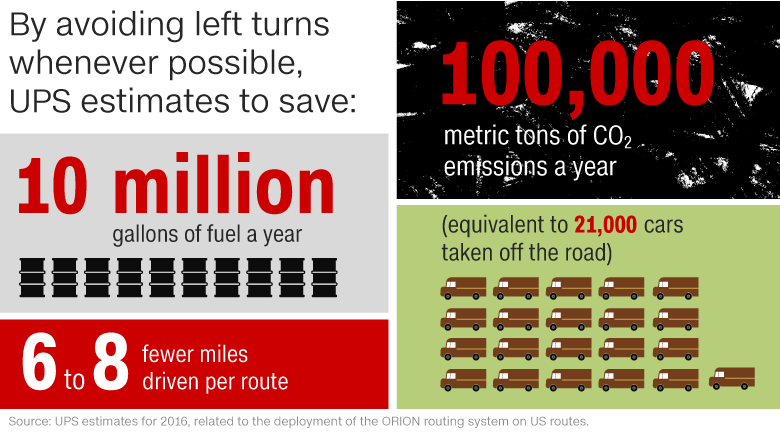 So, unless a left is unavoidable — the carrier saves millions of gallons of fuel each year, and avoids emissions equivalent to over 20,000 passenger cars. The practice started decades ago, before computers and GPS, and is now managed by a software that conjures the most efficient route for each truck. What’s wrong with turning left? Left-hand turns are generally considered unsafe and wasteful on right-hand driving roads, such as those in the US. “This can not only be dangerous, but makes traffic build up, unless you install a dedicated left-turn ‘phase,’ which is fine but basically adds 30 or 45 seconds to everyone else’s single time,” he said. A study on crash factors in intersection-related accidents from the US National Highway Traffic Safety Association shows that turning left is one of the leading “critical pre-crash events” (an event that made a collision inevitable), occurring in 22.2 percent of crashes, as opposed to 1.2 percent for right turns. About 61 percent of crashes that occur while turning or crossing an intersection involve left turns, as opposed to just 3.1 percent involving right turns. Left turns are also three times more likely to kill pedestrians than right ones, according to data collected by New York City’s transportation planners. The procedure is now incorporated in most countries around the world. To this end, the carrier created its own maps, which it says are more accurate that commercially available ones: “We can differentiate more important left-hand turns from unimportant ones. Google Maps has no concept of not making a left-hand turn, it just shows the most direct way to reach your destination. We have the ability to penalize some of those”. The system knows about parking lots, private driveways, variable speed limits and roads that are inaccessible for a truck. The software can give an undesirable left turn a penalty that adds 20 seconds to the estimated route time. In that case, going around the block and turning always right might offset that 20-second penalty: “We were able to turn off left hand turns,” said Levis. Taking a longer route while still saving time and fuel might sound confusing, even to UPS drivers, according to Vanderbilt: “I’ve actually been to UPS’s logistics center and discussed this with their lead engineers,” he said. The rule, says Levis, can also be applied to left-hand driving countries, such as Australia and the UK, where it discourages right-hand turns. UPS started avoiding left turns in the 1970s, when it came up with a method called “loop dispatch,” plotting deliveries in a right-turning loop and starting with one side of the street first. 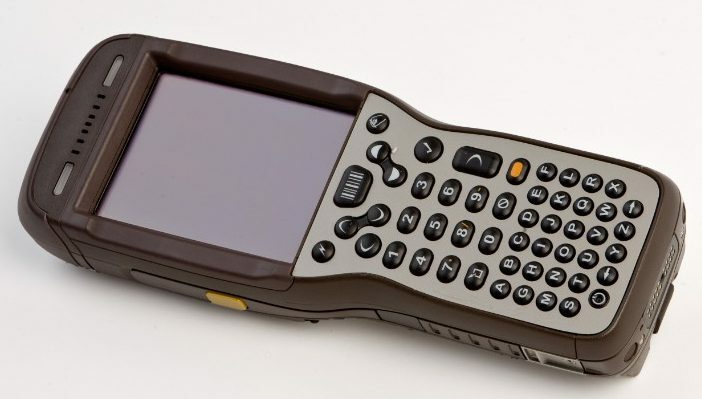 This hand-held computer provides the order of delivery to the driver. In 2008, it launched a routing software to calculate the best possible route for each truck while favoring right-hand turns, called Orion: “It took 10 years to get it right. The hardest part was making it think more like a driver and less like a computer,” said Levis. Should you do it too? “This no left hand turn discussion came out of a conversation about what regular consumers can do to be more fuel efficient,” explains Levis. Examples would be consolidating trips, parking in a central location to walk to several nearby destinations, and using the right vehicle for the job. But would an avoidance of left-hand turns help save fuel, or time, in everyday driving? Most of us are not going to multiple different addresses, but faced with the challenge of optimizing a daily commute that may not have changed for years, says Gerdes: “Eliminating left turns cannot in many cases be incorporated into our own more rigid daily routing, so my suggestion is to map multiple routes and work them into your commute. “Do not stop the optimization as traffic, roads and conditions change year over year for many of us. If one route has a new roundabout for example, try it! When I experience a new roundabout on a road I have discarded for decades because of stop signs or non-priority lights, I will prioritize this new route over others, while saving both fuel and time.